A new intriguing documentary filmed in Virtual Reality (360) and edited published both in Virtual Reality (360) and standard (non-360) format. Synopsis: With the Syrian conflict now its 8th year, millions of people continue to be displaced from the only home they have ever known. 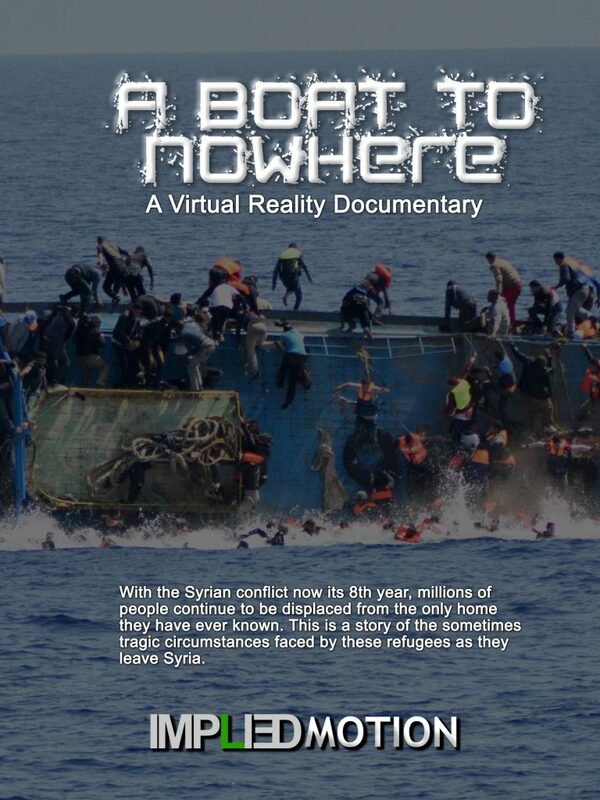 “A Boat to Nowhere” is a story of the sometimes-tragic circumstances faced by these refugees as they leave Syria. Who are transferred to camps like the Zaatari village in Jordan and attempt to cross the Mediterranean heading towards Europe in a hope of a better life. Treatment: This documentary showcases first-hand stories of Syrian refuges, their families and their desperate attempt to get out of Syria, through Turkey, to cross the Mediterranean ocean and reach Europe. Many of them have been told that Germany will welcome them. But, when they reach Germany, they discover re-settlement can very difficult. Filmed on location in Greece, Macedonia, Serbia, Budapest, Vienna, Germany and Syria. This program will include actual reenactments to give the audience a real sense of the danger and sacrifice that these refugees have gone through to cross the ocean and find a better life for themselves. Across the Mediterranean, millions of refugees, largely from Syria, escaping war, persecution, and poverty will have entered Europe by the end of 2017, the United Nations estimates. 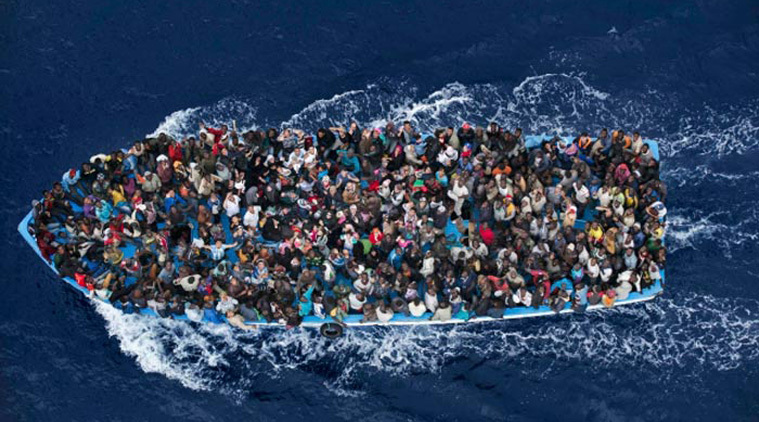 Thousands of these refugees and migrants have died attempting to cross the ocean. Many of these refugees, include women and children. Syrians are fleeing their country because it is engulfed in a civil war. There could be over 4.87 million Syrian refugees registered with the UN by the end of 2017. An estimated 200,000 Syrian refugees are staying in camps in Turkish cities along the Syria border. A large number are in a camp at Nizup, while many others are entering through the border at Akcakale, in the southeastern Turkish province of Sanliurfa. According to local Turkish media, in at least 10 cities the number of Syrian refugees “now constitutes a sizeable portion of the city”, including in Kilis, which sits on the border. Refugees then travel west, through Turkey, and arrive at coastal cities, such as Izmir. After arriving there, they prepare to travel by boat to Greece. In Izmir, on Turkey’s Aegean coast, thousands of refugees are staying in tents and hostels before making their way across the sea. Along the coastline, criminal gangs are reportedly charging Syrian families tens of thousands of dollars to transport them to Greece. The photo above portrays a dinghy overcrowded with Syrian refugee’s which drifts in the Aegean Sea between Turkey and Greece after its motor broke down off the Greek island of Kos. Refugees face the perilous journey by boats across the sea to Greece. Many make their way to major cities such as Athens. Poor weather often creates incredibly dangerous conditions as people cross the Aegean Sea in rubber dinghies, boats, or ferries. More than 3,500 people have died while attempting to get to Greece. After crossing the Aegean, many refugees travel through islands in Greece such as Kos and Lesbos and then to the mainland. Others arrive in cities such as Idomeni and Athens. In Athens, makeshift camps are being set up in public spaces such as Victoria Square. Refugees then move north, mostly on foot, and arrive to the city of Gevgelija on the Greece-Macedonia border. Refugees generally move across Macedonia by train. After the five-hour ride from Gevgelija, they reach Tabanovce in the northern part of the country, on the Serbian border. A small minority of the refugees can afford to travel by taxi or coach to the border, most cannot. Refugees then move through Serbia and into Hungary. They generally cross into Hungary in and around the village of Roszke. Many refugees then travel by train or coach to Budapest, Hungary’s capital, from where they can catch trains to the Austrian capital of Vienna. Finally, most of these Syrian refugees arrive in Germany. Chancellor of Germany, Angela Merkel’s reputation on welcoming these new immigrants has meant that between 2015 and 2017 more than 1.3 million refugees have arrived in Germany. What has happened to these people who have risked everything to get to Germany? Have they been able to find work? Re-settle? Or are they still stuck between countries and cultures trying to figure out where to go next? Ruaa Abu Rashed, a 23-year-old refugee from Syria, arrived in Germany after weeks of treacherous travel, including a near fatal boat journey across the Mediterranean when she was only 18 years of age. She talks to us about her initial shock, how cold Germany can be in Winter. Four years after her arrival, she is now a competent German speaker who is about to take up a degree course at a university. She is adamant that much as she misses her native Syria, she has invested too much in her German life to ever return. “I have to take a deep breath sometimes when I think of everything that has happened in the last few years,” she says, sitting in a riverside cafe sipping coffee in her new home town of Lüneburg, in northern Germany. She continued to wear sandals for weeks, despite sub-zero temperatures, and a combination of hating the processed meat and egg dishes they were given and the sadness she felt caused her to lose 6kg (13lbs). In more recent months, some refugees from war-torn Syria, claim that racism against them has increased in Germany as a growing anti-Muslim movement sees soaring attacks on foreigners. Germany has been gripped by a spate of anti-foreigner’s rallies, violence and arson attacks against refugee homes or would-be shelters. One Syrian refugee says, “I want to return to Syria – very afraid here,’ he said in broken English, speaking outside a refugee center in the small eastern town of Freital in Germany. ‘I come from Syria because I was afraid – but here big afraid,’ said Taher, who did not want to give his full name, speaking in halting English. Germany is currently struggling to cope with a record influx of refugees with 500,000 expected this year, fleeing war and poverty in Syria, Iraq and Afghanistan, African nations and recession-stricken Balkan countries. What will the future hold of these new immigrants? Will they be able to be integrated fully into Germany?